May 17, 2015. Race weekend started on Saturday. I drove up to Tempe and picked up my packet. TriSports teammate Scott Perrine was gracious enough to allow me spend the night at his house. Scott prepared a great dinner and then relaxation was the focus of the night. Early to bed for an early morning. Sunday began at 4am. After getting dressed and preparing my fluids I was off to Tempe Town Lake. I ate a bagel, banana and drank a bottle of Gatorade on the way. Due to excessive rain on Friday night the probability of the swim was unknown. The city had to conduct a ecoli test, the results of which would be known at 5am…the race was scheduled to start at 6:30 (sprint)/7:00 (olympic). A backup plan (run) had been announced by the race director the previous day in case a swim was not allowed. After parking in the designated parking garage it was a 1/2 mile walk across the Mill Ave. bridge to the transition area. As I was walking across the bridge I heard the race director announce that the swim was a go! Transition was located under a bridge in the shade…a nice thing in the heat of Arizona. Race morning was cooler than usual but the shade was still appreciated. I racked my bike on my designated rack and sat up my gear, got body marked and hit the potra pottie before the lines got long. After a bit of socializing, it was time to start pulling on my wetsuit. after which I walked down to the lake and watched the sprint waves start. Waves were started 4 minutes apart. The first wave of the olympic distance race started at 7:00. The young guys started first and I was in the 3rd wave…men 45+. The 1500 meter swim was a single clockwise rectangle. I lined up in the front row on the left side. At the sound of the horn I quickly settled into a solid pace. I had clean water in front of me and was able to immediately get into a full stroke. As I approached the first turn buoy I ran into a large group from the previous wave. I made my way through them without any problems. Swimming down the back side was uneventful until I approached the bridge. The pylons blocked the view of the next turn buoy. I swam very slightly off course but quickly corrected once the buoy came into sight. I made the last turn and headed into the beach. I exited the water in 24:19 the 24th fastest swim overall. The run to T1 was about 900 ft and up a flight of stairs. I used this time to get my wetsuit down to my waist and removed my cap and goggles. I quickly found my transition area, finished removing my wetsuit, put on my helmet, grabbed my bike and ran to the mount line. In and out of T1 in 1:11. I threw my leg over my bike and headed out on the 40k course. I slipped my shoes on and got up to speed. The course is a 2 lap course, mostly flat with a few small hills, 3 180 turns and about 16 turns per lap. The sun was starting to heat up the course and the wind started to blow. My legs felt good and I pushed through the wind. The bike went well and I passed numerous people. I slipped my shoes off as I approached T2. I jumped off the bike running at the dismount line. I was off the bike in 1:04:49. I averaged 22.9 mph and had the 13th fastest bike overall. Into T2 I quickly racked my bike, removed my helmet, put on my socks and running shoes, grabbed my hat, glasses, and number belt then hit the run course. In and out of T2 in 1:06. The 10k run was a 2 loop course around the lake. Flat and fast except for a couple flights of stairs each loop. My legs were feeling good. I went through the first mile in 7:02. I made sure to take water at all the aid stations with the building heat. One cup over the head and one to drink. the second mile came in 6:51. Mile 3 included the stairs and came went by in 7:22. Mile 4 was a 7:03. A 6:58 mile followed and then up the stairs again for a 7:34 6th mile. The last 630 ft of the run was up hill to the finish and I held a 8:04 pace. Total run time 43:51 (7:11 average pace) and 34th fastest run overall. I crossed the line in 2:15:14, 18th overall (including 5 pros) and 2nd in the 50-54 agegroup and a new olympic distance PR. Next up is the Deuces Wild olympic distance triathlon in 2 weeks. May 2, 2015. After an early morning wake up I made the 45 minute drive south to Sahuarita. The manmade lake at Rancho Sahuarita was the location for the return of triathlon in Sahuarita. 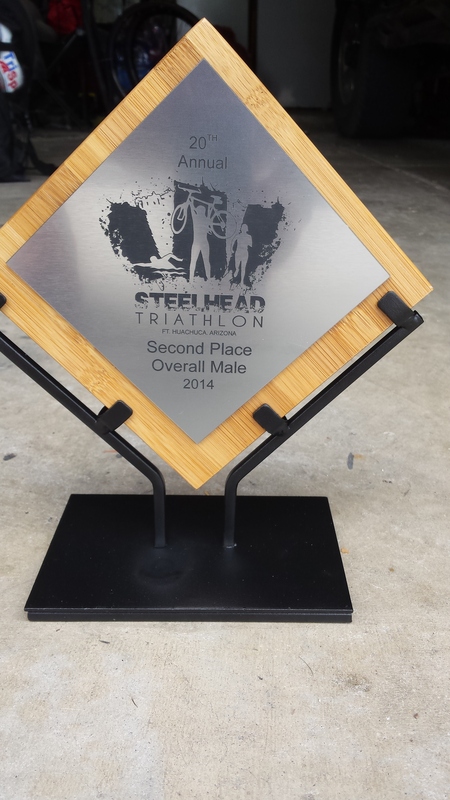 Haka Multisport put together a great Olympic distance race course. 1500 meter swim (measured a little short on my Garmin just over 1300) in Sahuarita lake, a one loop 40k bike that included some hills to break things up, and flat and fast 10k run. Race morning water temps were about 70 degrees and wetsuit legal, and over cast skies kept the morning temps nice. However the winds decided they wanted to stir things up a bit. After the performance of a Haka (click here if you don’t know what a Haka is) is was race time. I started in the 3rd wave which contained all men 45+. In the comfort of my BlueSeventy Helix wetsuit I entered the water and swam to the start line. The swim was one counter clockwise loop of the lake that hugged the contours of the shoreline. I lined up in the front row left side. At the sound of the horn I swam a straight line for the first buoy. as I rounded the first buoy I saw that I was leading the pack…a first for me. 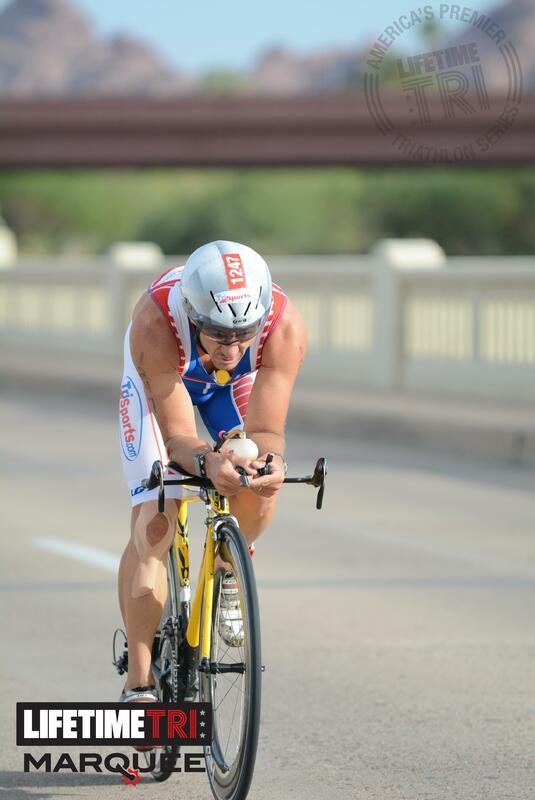 I settled into a hard but comfortable pace and continued to open the gap. I swam the straightest line possible through the buoys. I soon began catching stragglers from the second wave and by the time I reached the turn at the far end of the lake I began to swim through a large group of second wave athletes and 1st wave stragglers. I found a clean line through them and again had open water in front of me. Out of the water I took a look back and saw no one near. Swim time 20:22…fastest in my agegroup (50-54) and 6th fastest overall. The run from the water was about 450 ft. and uphill. 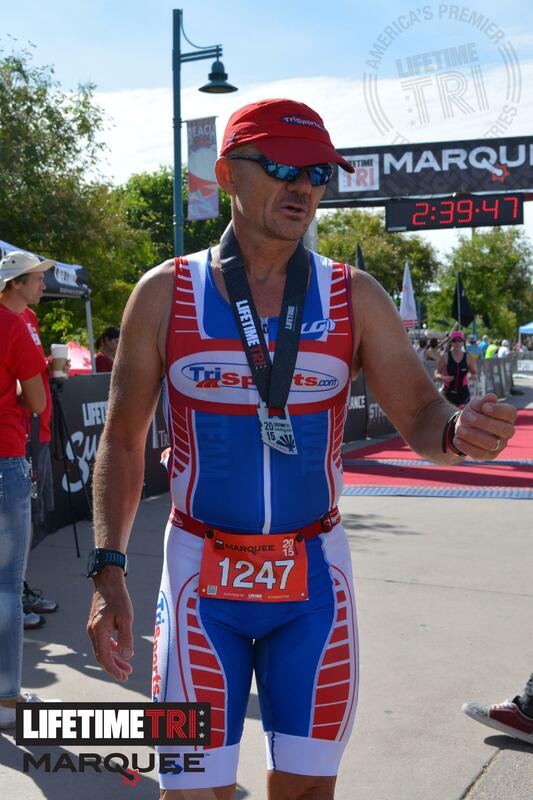 I pulled my wetsuit down to my waste and removed my cap and goggles during the run to T1. I got quickly out of my wetsuit and put my helmet on. Un-racked my bike and was out of T1 in 1:26. At the mount line I jumped on my bike and got up to speed. I slipped on my shoes and began the slight climb that starts the bike. After the hill the road flattens out and the winds took over. I felt great on the bike and was passing people throughout the ride. At about the 6 mile mark the course turns and begins a long steady climb for about 4 miles and is followed by a few more miles of uphill rollers. The last 3-4 miles is a fast decent back to T2. Total climbing on the course was just over 1000 ft. Bike time 1:08:53…fastest in my agegroup and 3rd fastest overall. After slipping out of my shoes on the bike, I jumped off my bike at the dismount line and ran into T2. Racked my bike, took of my helmet and then slipped into my running shoes. I grabbed my hat, glasses, and number belt and hit the run course. In and out of T2 in :50. 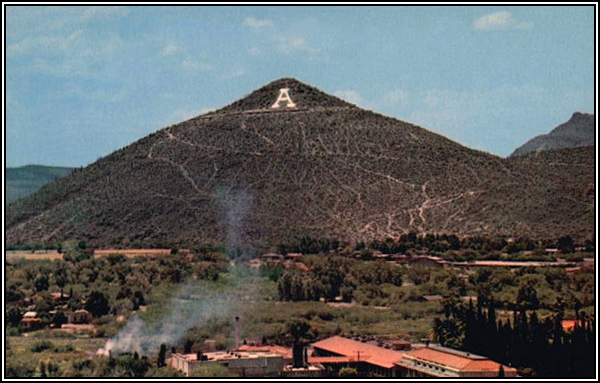 A slight hill took us up to the “adventure trail” which looped around the Rancho Sahuarita community. A mostly flat and fast loop followed by a loop around the lake. I felt good for the first 4 miles. Through mile 1 in 7:16, mile 2 in 7:13, mile 3 in 7:24 and mile 4 in 7:36. I then started to feel the lack of run fitness from lack of miles from my injured knee. Mile 5 slowed to an 8:01 then i decided to bear down and push through the final mile in 7:38 and the last .2 miles at 7:27 pace. Run time 45:46…fastest in my agegroup and 6th fastest overall. 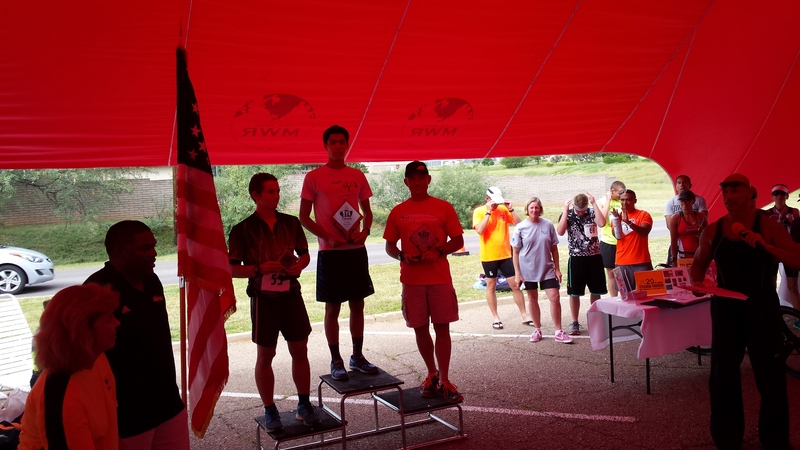 Total time 2:17:18….1st in agegroup (by 19 minutes) and 3rd overall. I missed 2nd by 8 seconds. Unfortunately he started in the 1st wave so I had no idea how close I was to him. This is a great race to put on your calendar for next year and the race director has even more in store for next year! Check it out. First race of the season is in the books. 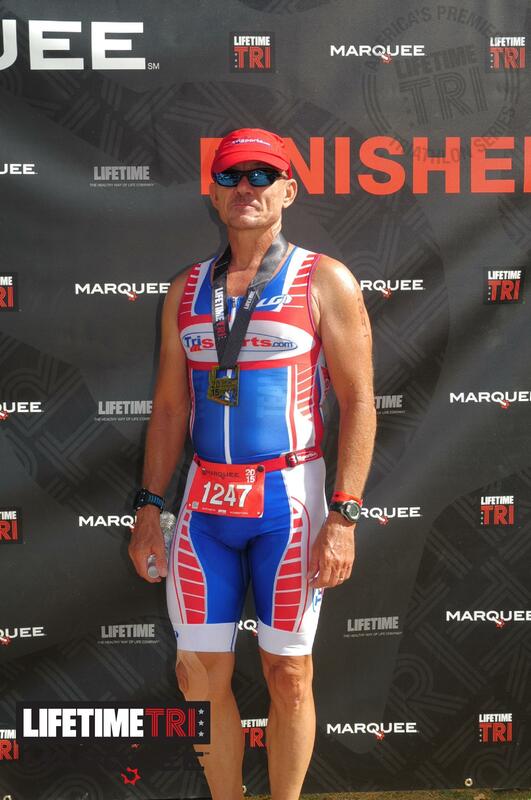 2015 Life Time Tri Marquee in Tempe, Az. on Apr.12 was my first olympic distance race in over 15 years. Leading into the race I have been dealing with a knee issue. My running has been cut from my usual 40+ miles per week to a painful 8-10. Run fitness was pretty much non existent. That said the plan going in was to have a solid swim, ride hard and hobble home. Race morning alarm went off at 3:00. After a quick breakfast I met up with my coach, Brian Stover of Accelerate3. Brian was my ride for the day to Tempe. We had made arrangements with the race director to pick up our race packets on race morning. We arrived at Tempe Town Lake at 5:30, giving us 15 minutes to get our packets. After getting our packets I found my assigned rack spot and went about setting up my gear. For some reason the guy racked next to me decided to set up his gear on the back side of his bike…not leaving me much room. I kindly suggested that there would be more room for everyone if he would set up on the proper side. The suggestion fell on deaf ears. So I set up in what space I had. With about 25 minutes until the first wave started, I made my way down near the lake and put my new BlueSeventy Helix wetsuit on. They then lined up the waves. I was in the 5th wave, mens 50+. There was 4 minutes between waves so my wave was set to go off at 6:50. After the singing of the National Anthem by friend and fellow 50-54 agegroup athlete Dan Cadriel, The pro athletes were off. 3 more waves and then it was our turn. As soon as the 4th wave was off we were allowed to jump into the water. I was among the first in and swam to the start line. The buoy line curved slightly to the right so I lined up in the front row on the far right side. The plan was to swim a straight line to the turn buoy. The horn sounded and off I went. From the start I had clear water. Most everyone else was hugging the buoy line. My plan worked well. My sighting was on and I felt good. The 69 degree water temps were perfect and the new wetsuit was working great. About 300 meters into the swim I started catching some of the green caps that started in the wave before me. As I got to the turn buoy I caught a large group of green caps but was able to navigate my way through them fairly smoothly with minimal contact. On the back stretch of the swim i swam the buoy line. I passed numerous other competitors from the earlier waves. I made the final turn and headed in to the exit stairs. The volunteers assisted me to my feet and the strippers did their job efficiently, quickly removing my wetsuit. 1500 meter swim time…25:43 (5th in my agegroup/78th overall), right about what I figured it would be. Once on the bike I quickly got up to speed and got my feet into my shoes. The course is a 2 loop flat, fast course with wide fast turns and a few 180 degree turn arounds each loop. Throughout the bike my legs felt good. the first loop went smooth. By the second loop the the sprint and slower competitors had made their way onto the course. I had to keep my head up looking out for traffic throughout the loop. Riders were all over the road, riding on the right, not holding lines through the turns and making conditions dangerous. On several occasions I had to slow my pace so that I could safely pass. But I made my way safely. As I made my way towards T2, I slipped my feet out of my shoes. I made the last turn and stepped off my bike at the dismount line running. 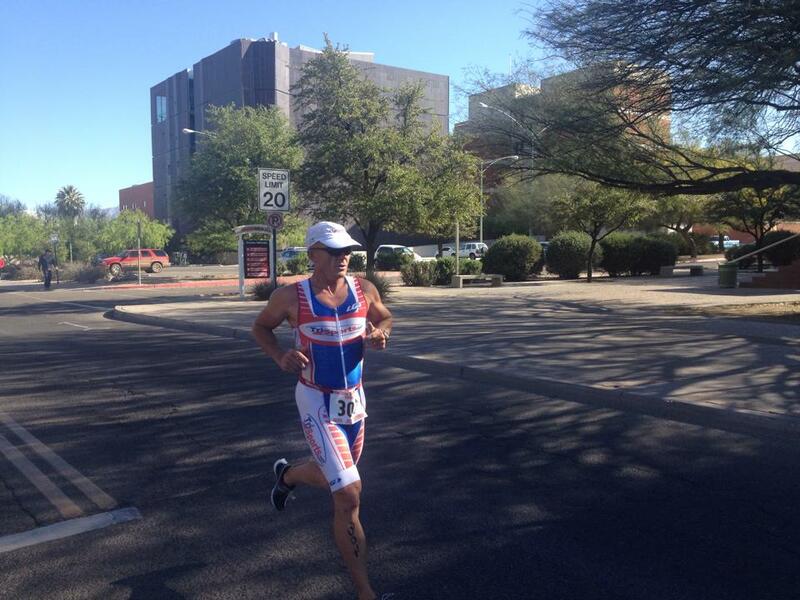 40k Bike time…1:03:48 (4th in agegroup/35th overall). Racked my bike, removed my helmet, put on my run shoes, and then as I ran out of T2 I put on my hat and glasses and sucked down a gel. As expected, right from the start my knee began to hurt. The concrete run course was no help. However, once I got warmed up my knee bothered me less. The course was 2 loops around the lake. The sun was getting warmer and I made sure to hydrate well at every aid station. The first loop I was able to maintain around 7:30 pace. I was passing some of the slower people, but as expected the fast runners began to go by me. By mile 4 my knee began to hurt more and my lack of run fitness began to catch up with me as my pace slowed. With about half a mile to go my knee got very painful and I limped my way to the finish line. 10k Run time…51:49 (18th in agegroup/174th overall). I was hoping to go :50 or under…but I found out the course was a little long so I was right at my goal. I crossed the line in 2:23:55, only about a minute off my best time 15+ years ago as a much younger person. I was 7th in the 50-54 agegroup and 71st overall (out of 550). After the race my knee was quite sore. Ibuprofen and ice helped alleviate the pain. Next up is TriZona Sahuarita, Tempe International and Deuces Wild all in May. That will be followed by no running to allow the knee to properly heal. Then hopefully I will be able to squeeze in a few late season races. 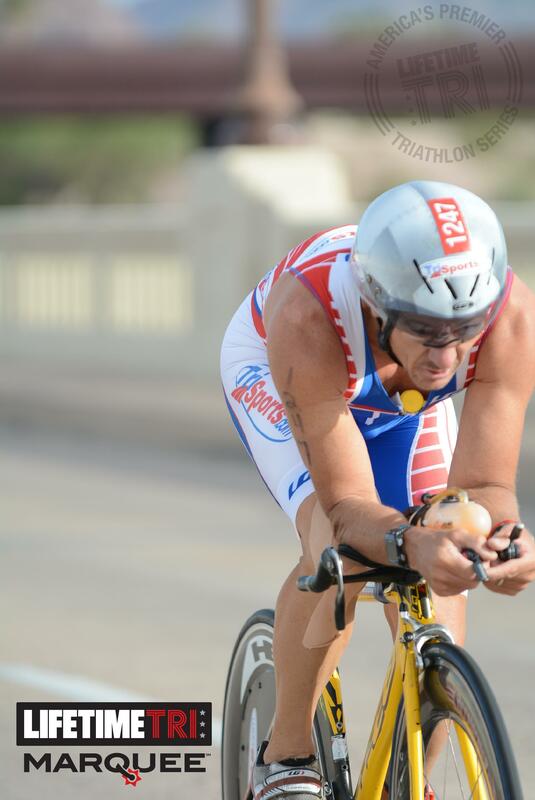 2014 HITS Lake Havasu….140.6 miles to finish off the season. On Nov 7 2014 I jumped in my loaded vehicle and made the 5.5 hour drive from Tucson to Lake Havasu. Upon arrival I hit the race venue and picked up my race packet, made a grocery stop to pick up dinner and breakfast supplies and then seeked refuge from the heat in my hotel room. I put the finishing touches on my equipment, watched a little television to unwind and then got an early start on sleep. I think I woke up about every hour and a half throughout the night but felt rested when my alarm went off at 4:30am. I consumed a banana, 2 berry bagels and a yogurt for breakfast, got dressed and loaded my race equipment and made the 10 minute drive to the venue. Transition spaces were assigned, each spot held your bikes front wheel and had a stool plus plenty of space to place your gear (one of the nicest transition setups I have seen). Large lights lit up the entire area to make early morning (pre-sun) set up easy. I made a quick trip to the porta-potties before the crowds arrived and then relaxed a bit. Before I knew it, it was time to get into my wetsuit and head down to the water. Water temp was in the mid 70s. I got in and warmed up for about 200 yards before they called all athletes out of the water for a pre-race meeting and the playing of the national anthem. The start was a shore line start followed by two 1.2 mile laps . The start horn sounded and we were off. Sighting was near impossible with the sun low in the sky and in our eyes. The lack of buoys in between the turn buoys and the small size of the buoys only added to the difficulty. Fortunately I was not at the front and had the lead group to follow. At the end pf the first loop the half athletes headed off to T1 while those of us doing the full headed out for lap 2. I was suddenly on my own. luckily I could see the lead groups splashes and was able to follow until the buoys were in sight. I swam consistently through the entire swim. As I exited the water I was told I was in the top 10 (was 7th out of the water). Swim time…58:21. 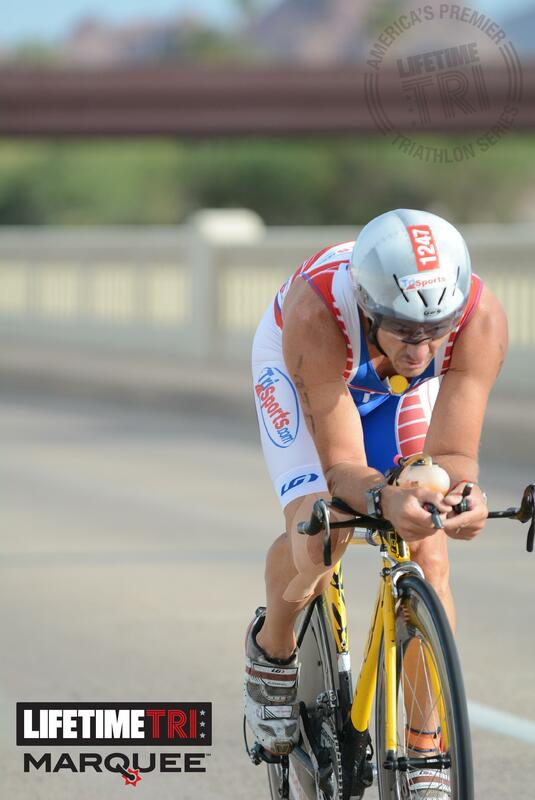 A short uphill run from the water to T1…wetsuit, swim cap and goggles off…helmet on. Mounted my bike at the line, got up to speed and slipped into my bike shoes. T1 time…1:35. I entered the bike course blind…I had not previewed the course but knew it was hilly from previously talking to friends. The course was 4 loops…112 miles. The plan was to take the first 2 laps relatively easy to save for the last 2 laps. I was quickly passing people trying to keep track of which race they were in (3300 numbers were the full). The first half of each lap was slightly rolling uphill. The far end of the course at the turn around area was where the fun begins…3 hills, each about 1/4 mile in length and 20+% grade followed by 30% grade downhills on the opposite sides. As I rode up the first time there were people from the half walking their bikes up! I powered up them. Only 3 more times to go! At about the 20 mile mark I was passed by another full distance athlete. I let him go and stuck to my pace. At mile 25 I had caught him again and made the pass. As I passed him I asked him if he knew how far ahead the leaders were. His response…you’re it! That motivated me a bit, but I still wasn’t 100% sure that there was no one else ahead. So I got back to business. Lap 2 was uneventful…those hills on the far end hurt just a little more. By now the heat had began to climb. What had started out in the morning as 60 degrees had now climbed into the upper 70s/low 80s and still climbing. Laps 3 and 4 dished out more of the same but now the wind decided to join the game. The far end of the course was blowing about 25-30 mph. By the 4th lap I was starting to feel some minor cramps in my legs. I had been getting in all my calories (a concentrated bottle of CarboPro and 3 root beer Gu’s) and fluids switching between the on course drink (HEED) and water but, the effort and heat were starting to get the best of me. So for the second half of the last lap I eased off the effort a bit, stretched my legs a little and massaged the cramping muscles. As I neared T2 I slipped my feet out of my shoes. I dismounted at the line and ran into transition. 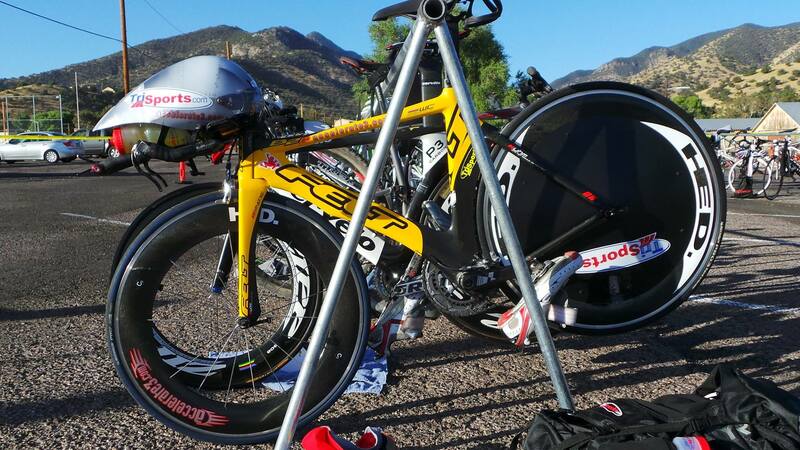 Bike time…5:38:46, the fastest of the day by 10 minutes. As I entered T2 it was confirmed that I was the leader. I racked my bike, removed my helmet and put my running shoes on. I took a little extra time to stretch and massage my legs a little. T2…2:18. The temps were now hitting 90. The run was 2 horseshoe shaped out and backs, 13.1 miles each (26.2 miles) of slight rolling terrain with a couple of short climbs. I knew this was going to be a tough run. I ran down through the park to the water front, under the London Bridge and then decided it would be a good idea to walk up the ramp that took us from the bottom of the bridge to the street level. By the time I hit the first aid station my legs were cramping. I started my fueling…coke and water. And more water over the head to try and cool down. I shuffled through the lakefront campground and up the uphill back to the main road. The cramps began to get more intense. By mile 3 I was shuffling and walking but continued to lead. When walking I told myself if I was going to walk, I was going to walk as fast as I could. Just past mile 6 at the turn around I was caught and passed. still in second I was determined to keep moving forward as fast as I could. By the end of the first lap I was still hanging on to 4th place. The 2nd lap started off with more walking than running. My legs would cramp up every time I began to run. At about mile 14 I caught up with another athlete who was on his 1st lap. He was having the same issues I was. We started working together. We would pick a spot up ahead and run to it…by then my cramps were usually in ouch mode, we would walk to another point and then repeat. We did this until about mile 18. I started cramping really bad then and he pull ahead of me up the road. By mile 19 the sun was setting and it had started to cool down. I then devised a plan. I started out small…run 30 steps, walk 20 steps. I was feeling okay doing this so I decided to up it…run 40 steps, walk 20. By mile 21 I had caught up to my old partner but he had been reduced to walking only. I was feeling okay so I decided that I was going to run until I couldn’t run any longer.To my surprise, with the cooler temps I was feeling pretty good. I maintained a steady run pace the last 4 miles all the way to the finish line…where I immediately cramped up. one of my worst ironman runs ever…5:28:01. The day done, I was able to hold on for 10th place overall, 8th male and 2nd in the 50-54 agegroup. 12:09:03. One of the hardest ironman distance race I have done. 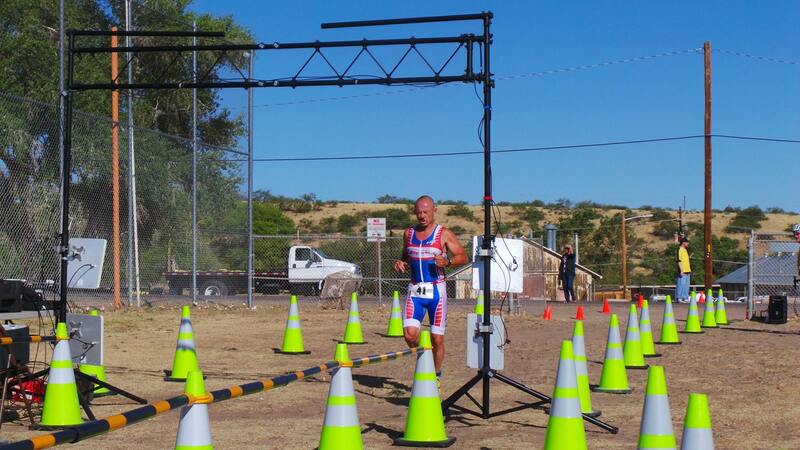 Tough course and tough conditions…heat, hills, and wind! And a big thanks to my wife who tolerates this madness! 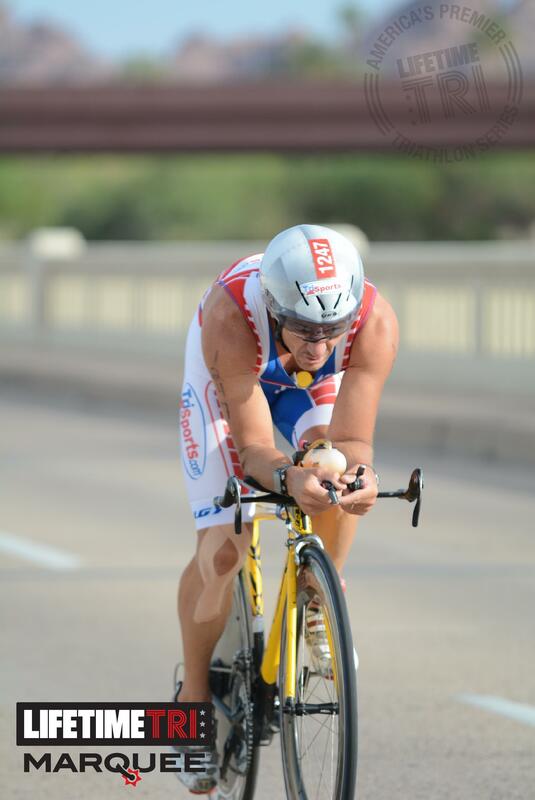 The week of Oct.13-19 Was my last big training week before my Ironman taper. My week started with a 30 minute run, 2 hour bike and 1 hour 10 minutes in the pool. Tuesday brought a 2 hour 45 minute trail run with lots of hills followed by 2 hours on the bike. Wensday started with a 30 minute run, followed by 2 hours on the bike with threshold intervals and then 1 hour 10 minutes in the pool. Thursday started on the track with 2×4000, an easy hour on the bike and 1 hour 7 minutes in the pool. Friday was 130 miles on the bike. Saturday was a 30 minute run, 2 hour bike and 1 hour 10 minutes in the pool. To cap the week off I decided to test my legs with the A Mountain half marathon. 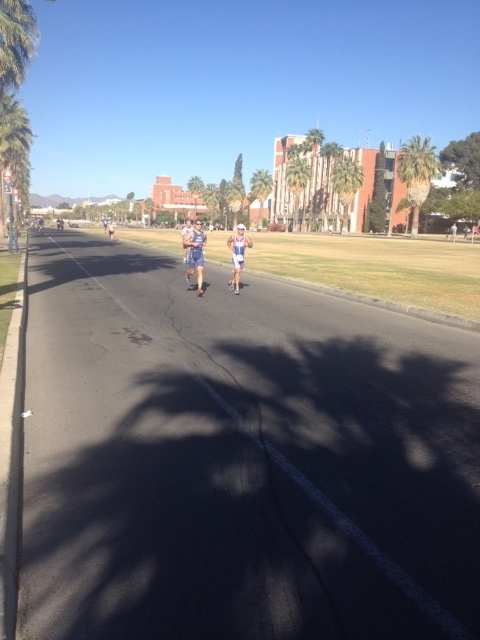 13.1 miles that begins flat in downtown Tucson. After which at mile 6.5 you begin the 275 ft accent of A Mountain (over about 1 mile) followed by equal downhill. That is followed by an out and back on the Santa Cruz River path before making your way back to the finish downtown. Prior to the race I thought that a 1:40 would be a really good day with the training week I had put in. I planned on going out at a comfortable pace until A Mountain and then pick the pace up. At the sound of the gun we were off. The first 3 miles I was averaging about 7-7:05 pace. My legs were feeling good and I was comfortable. I was just off the back of the lead group, with a few really fast guys off the front. The next 3 miles I was at 6:55 mile pace and still feeling good. As the climb started I began to pass all those that went out to hard. I probably passed a dozen people. he downhill saw several more people picked off as they descended on heavy legs. I made an effort to catch one more guy in front of me and then settled into his pace as we passed several more people. With about 2 miles to go my calves started to tighten up. I could no longer hold that pace and I let my “pacer” start to slip away. I slowed into a manageable pace and continued back into downtown. I was passed by one runner. I turned the last corner and saw the 13 mile sign…1/10 of a mile to go! I crossed the line finishing in 1:34:01 as the 21st male overall (26th overall) and 2nd in the 50-54 agegroup. Far exceeding my pre-race expectations. My totals for the week came in at 13000 yards in the pool, 305 miles on the bike and 50 miles running. Now it’s time to enjoy 3 weeks of taper before towing the line at HITS Lake Havasu for the full distance (ironman). How does one celebrate their 50th birthday? If you’re me you wake up at 0300, aet a quick breakfast, throw your gear in the car and head to Sierra Vista, Az. 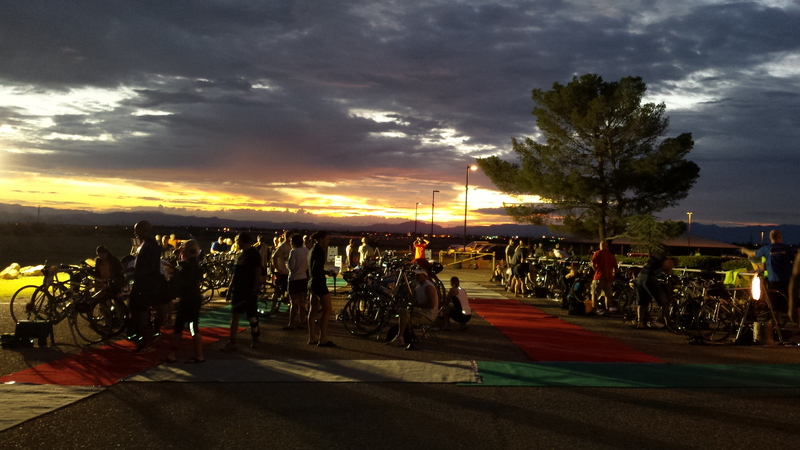 for the 20th Annual Steelhead Triathlon on Ft. Huachuca. The race consists of an 800 yard pool swim, 12 mile hilly bike and a 3.1 mile hilly run. After arriving I racked my bike, set up my gear and picked up my packet. I was in the 4th wave so had a little extra time to warm up with a short run and make one last potty pitstop. I then waited for my lane to clear and got a short swim warm up in. The horn sounded and we were off. I settled into a good solid pace. The swimmer in the next lane was a member of the Mexican National Triathlon team. I watched as he lapped me 4 times during the swim. But I seemed to be doing well against everyone else. I was out of the pool in 13:09. A quick glance at the pool saw most people were still swimming. There was a short run to T1. T1 was quick. Goggles off, helmet on, go! 2:19. Once on the bike I slipped my shoes on and got up to speed. The out and back bike course starts with a short rolling downhill into a sharp turn. The course continues to roll until the 2 mile mark then climbs 325 feet to the turn around. I passed a couple people in the first 2 miles. 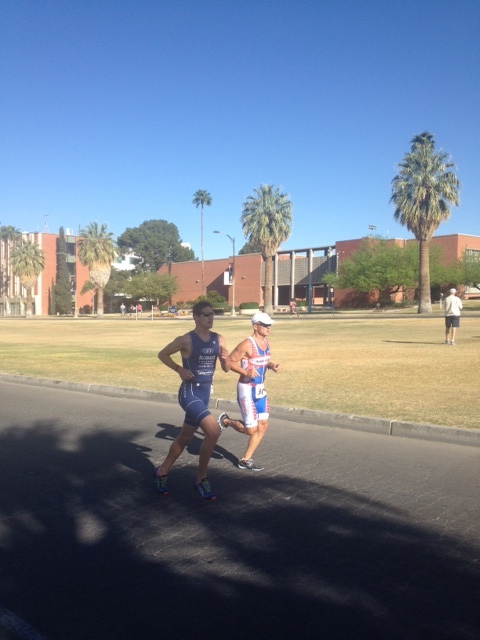 As I approached the turn around I saw the leader…the Mexican National team kid. I had closed the gap down from 3 minutes to about 2 minutes. I was off the bike in 30:00 (average speed 23mph) and had closed the gap down to about 1:30. I was in and out of T2 in 1:02. Shoes off on the bike, helmet off, running shoes on. I put my hat and race belt on on the go. The out and back run course is pretty much downhill to the turn around dropping 87 feet to the turn around. Then climb back to the finish. My legs were tired but I managed to average 6:39 mile pace. The first mile came in 6:12, followed by a 6:31 mile and slowed to a 7:15 uphill mile. I lost time to the leader but gained time on everyone else with a 20:16. Total time 1:06:59. 4:42 off the first place time of the 18 year old and 4:57 ahead of the 17 year old 3rd place finisher. I won my agegroup by over 20 minutes. 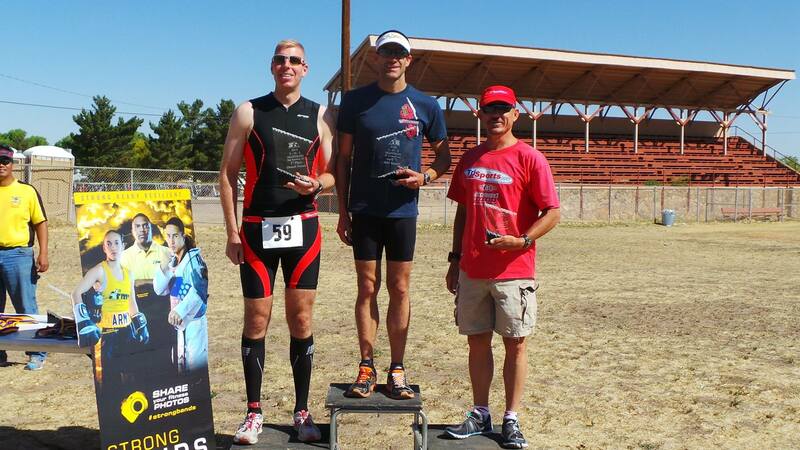 Fort Report Steelhead Triathlon 14 from U.S. Army Fort Huachuca on Vimeo. 3 months into the year and the miles are adding up. The month of January consisted of 76.41 miles of running, 682.95 miles on the bike and 28.52 miles in the pool. February the mileage bumped up to 93.74 miles of running, 713.63 miles on the bike and 26.14 miles of running. March continued the climb. 129.75 miles running, 725.83 miles riding and 25.23 miles of swimming. That makes 299.89 miles running, 2122.42 miles riding and 79.89 miles swimming. A total of 2502.19 miles covered in 3 months.